Each year I have to do a prof-check with an aviation examiner in a twin-engine aircraft to renew my multi-engine (ME) instrument rated (IR) pilot license. 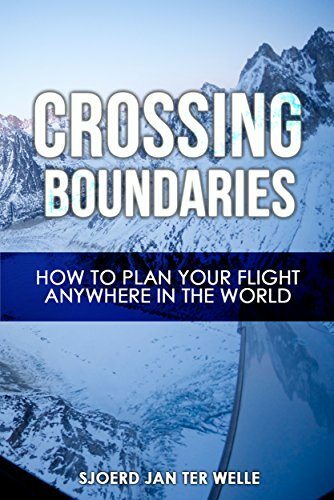 This one prof-check flight covers all that I need to fly single-engine and multi-engine aircraft under visual flight or instrument flight rules. For this prof-check to work out for all the different flight-type and aircraft categories, I have to do the prof-check flight in a multi-engine aircraft. The remainder of the year I do not fly that much in a twin-engine aircraft. Most of the year I fly in a Cessna 206 or 210 in Africa as part of the self-piloting safaris that I (help) organize through the Tour Operator African Flying Adventures. 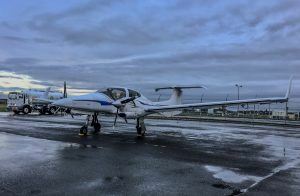 I got my twin-engine license on a Piper Seneca 2-200T but switched sometime later to the Twinstar from Diamond Aircraft. The Seneca 2 was a 6-seater and had no glass cockpit. The Diamond DA42 Twinstar is a 4-seater and has a glass-cockpit with modern engines running Jet A-1 fuel. The Diamon DA42 Twin-Engine Aircraft. To stay current on this aircraft without flying it regularly, I use a simulator. The simulator runs on my MacBook Pro with additional hard- and software. The simulator software I use is X-Plane. The DA42 aircraft model for X-Plane is sold by Carenado. 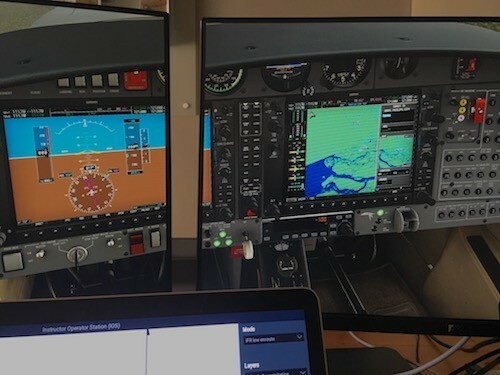 My simulator setup includes pedals, a joystick and two extra monitors and allows me to practice IFR procedures from behind my desk but cannot for 100% replace flying the actual aircraft now and then. My X-Plane simulator configuration with two extra monitors. I try to do a few flights on the Twinstar each year as well to stay current. Since the Twinstar is equipped with anti-icing equipment, it is a great aircraft to fly in winter time on IFR flights through Europe. This time we were heading towards Paris with the Twinstar. 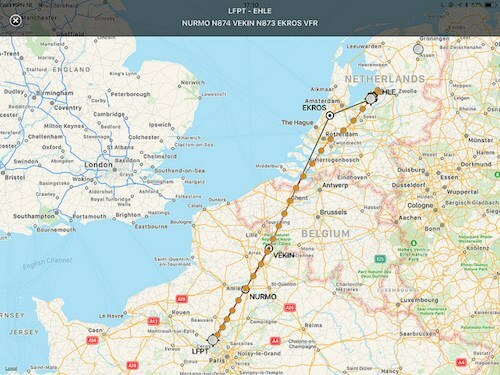 Our flight route from Lelystad to Paris. The reason for going to Paris on this trip was 2-fold. I needed some actual flying time in the aircraft with the moment approaching that I would have to do my yearly prof-check again. My wife Saskia wanted to go to the Christian Dior Exhibition in Musee des Arts Décoratifs in Paris before the exhibition would close down. Saskia is herself a fashion designer and wanted to take the opportunity to also visit some of her materials suppliers while in Paris while we were there. Friends came along sharing in the fun and flying costs. The departure was early on Thursday morning the 14th of December 2018. The weather was cold and wet. Some snow was still on the ground at Lelystad Airport (EHLE). 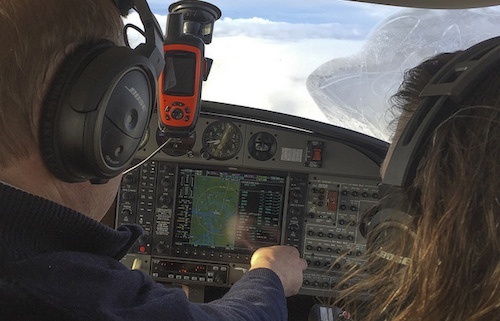 I was expecting instrument weather conditions for this flight to our destination Pontoise Airport (LFPT), so filed a flight plan with a route at flight level 120, which is about 12.000 feet in altitude. At this altitude, the outside air temperature was forecasted to be below -20 degrees Celsius, which would be cold but at a temperature range with less of a risk of getting icing problems. During the flight, we had to climb shortly to flight level 140 to stay clear of the winter weather below us. The temperature range from zero to -20 degrees is called the danger zone as supercooled water droplets can freeze instantly once they come into contact with the wings of the aircraft and do so primarily in the temperature range from freezing point to -20 degrees Celsius. Ice settling on the windows, but not on the leading edge of the wings. With even colder temperatures, the supercooled water droplets can’t remain in liquid form and icing particles are as such not as big a threat to deal with than the liquid supercooled water droplets. 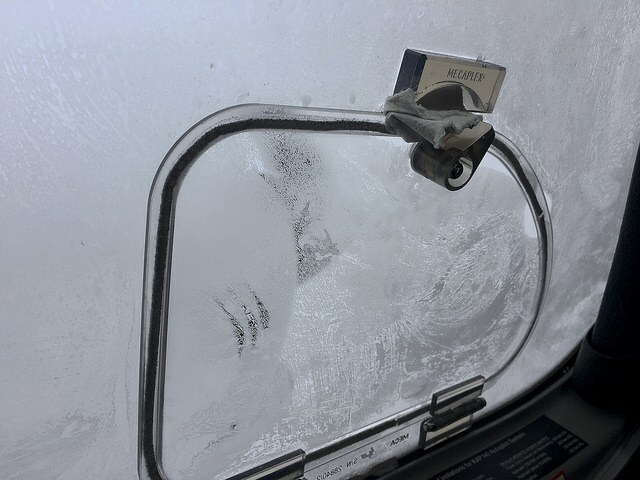 While climbing out to cruising altitude through the clouds, we had the option to turn on the anti-icing TKS system that would prevent ice from forming on the leading edges of the wings. The system forces glycol fluid called TKS through small holes which fluid forms a protective layer on the leading edge of the wings preventing ice from sticking to the wings. Once we are at altitude, we were flying above the clouds with the sun peeking into the aircraft. It would be a short trip with a flight on Thursday morning to Paris and a flight back the next day in the evening giving us effectively one and a half day in Paris. Pontoise Airport (LFPT) is an airport just northwest of Paris with an easy access into the city by taxi. We had already arranged with our taxi driver Mimid to come and pick us up from the airport. Saskia always calls upon Mimid to help her out when she travels to Paris. He could follow our flight progress on his smartphone. Our satellite link transmitted our position every five minutes and the progress was published to a website giving away or position on the map. 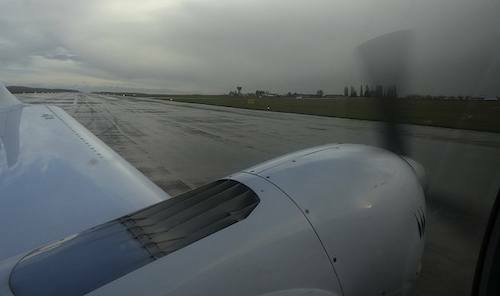 Turning around on the runway to taxi to the apron at Pontoise Airport. When we landed at Pontoise, Mimid was already waiting for us with his spotlessly clean taxi and his friendly smile. We secured the aircraft for the night on the apron right next to the tower and drove with our taxi driver to our hotel in the 9th arrondissement of Paris. Our taxi driver Mimid taking us to Paris. We walked from our hotel into the city and towards LaFayette. The Christmas decorations at LaFayette. 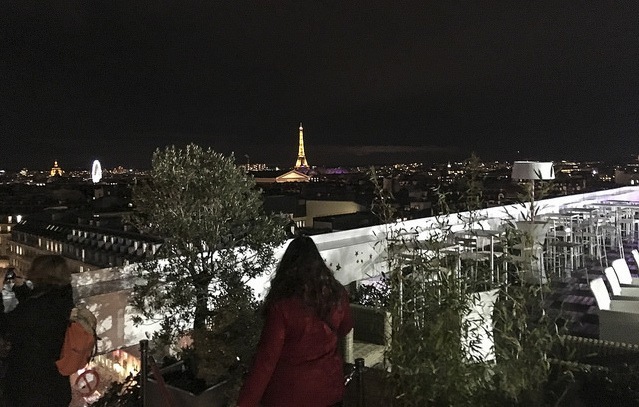 The shopping centre was decorated for Christmas and from its rooftop, we had a great view over Paris and the Eiffel Tower. Just around the corner of our hotel, we had dinner at Chartier. The waiting line at Chartier starts on the street. 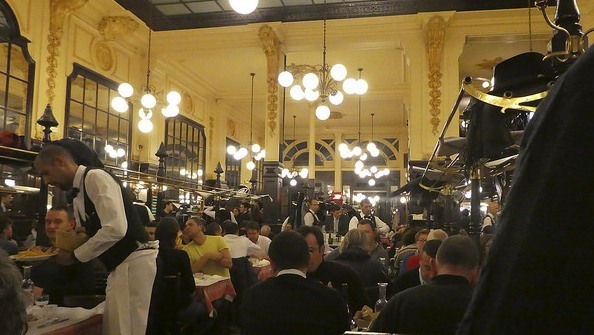 It is worth the wait as you get a good taste of how the Parisians eat out at this restaurant. Bouillon Chartier is an establishment that exists already for over 100 years and is dear to the native Parisians. Instead of having breakfast in our hotel the next morning, we opted to enjoy it just around the corner at one of those typical French cafes. The Musee des Art Décoratifs was just ten minutes away by taxi from our cafe. When we arrived at the museum, it became clear that we were not the only visitors going to the museum! A huge line had formed outside and it took us more than an hour to get inside. 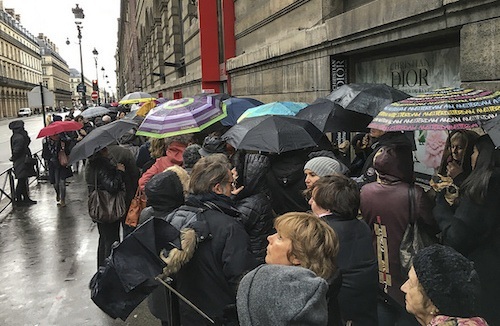 Waiting in line to enter Musee des Art Décoratifs, Paris. It was my Saskia’s dream to visit the Dior Exhibition. 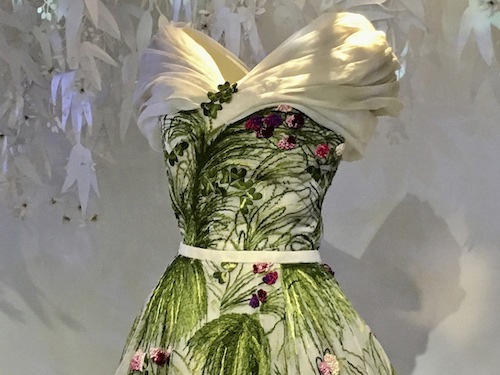 We spend several hours in the museum soaking up all the beautiful designs of Christian Dior. Time seemed to fly and before we knew it, we were heading back to Pontoise Airport for our night flight back to Lelystad Airport. I love flying aircraft at night if the weather conditions permit it. 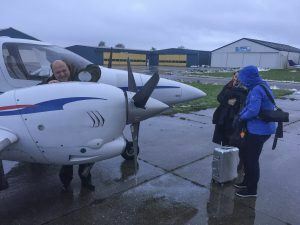 The weather forecast for Lelystad Airport for that night showed a possibility of the weather turning into foggy weather at our expected arrival time, so we filed the flight to Lelystad with Groningen Airport (EHGG) as an alternate destination. The weather forecast for Groningen was great all evening, so in case the weather at Lelystad would be worse than needed to land, we would divert to Groningen and land there instead. Climbing out from Pontoise towards the north. On our instrument approach into Lelystad Airport, there is a moment when you have to lower the landing gear in order to land. The gear is lowed by a gear handle in the cockpit and after it is lowered, three green lights turn on in the cockpit to confirm that the three wheels are in a locked position and all extended. Somehow I did not get the correct 3-greens indication and thus was not 100% sure of the landing gear being out, extended and locked into position. 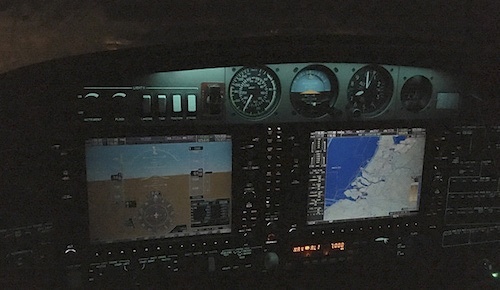 The cockpit of the Twinstar at night. I was still on the radio with the approach controllers of Schiphol and already had just passed the final approach fix (FAF) when I found out about the missing 3-greens and informed the controller about the situation. 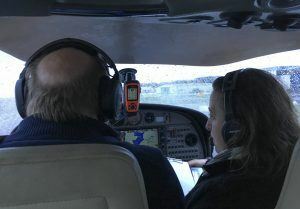 It is quite common that the approach to a smaller airport like Lelystad is coordinated at first with a controller from a larger nearby airport or approach area. In my case, Schiphol Approach was coordinating my approach into Lelystad Airport. 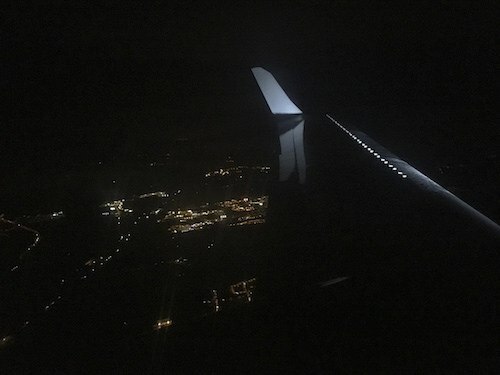 The air traffic controller switched me over to a discrete radio frequency where I could talk freely without disturbing the conversations between controllers and the crew of other aircraft inbound to Schiphol Airports. I informed him that I would like to continue the approach but not land the aircraft but fly low over the runway instead. This way, the airport staff could have a look at my aircraft from the ground and confirm that my gear was in a down position. After the low-approach, I would climb out to safe altitude again. 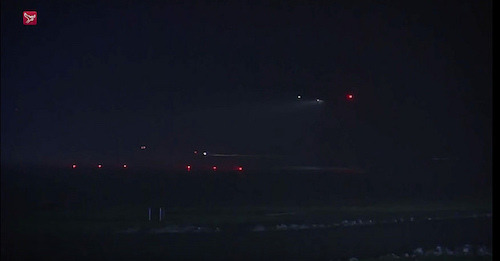 He agreed and arranged with the fire brigade at the airport to be standing by at the runway with spotlights. I did the approach twice from both directions of the runway. The gear seemed to be down, but it was not 100% sure if the landing gear was locked into position, so the rescue services were called in in case I would collapse through the landing gear on my landing. In the end, all went well and we landed safe and well. We made the news that night! As we were not sure of the landing gear being out and locked into position, the airport called upon the fire brigade and rescue services to stand-by during our landing. Our landing justs before 9 pm local time at Lelystad Airport. Expected Return from Forex Trading?